No, that is not a giant flower in a huge vase; it is in fact just a small TV. It is widely know that OLED screens are currently very small and very expensive. To give you an idea, the Sony OLED XEL-1 hit stores earlier this year priced at $2,500, as the XEL-1 is only 11″ this works out at $227 per inch! So not cheap then. This has posed quite a problem and Sony have been trying to increase the size but without much success, although Sony say this time next year they will have doubled the size of OLED TVs. In a year’s time we can get an OLED TV twice the size of current models… wow a whole 22″ for your viewing pleasure. 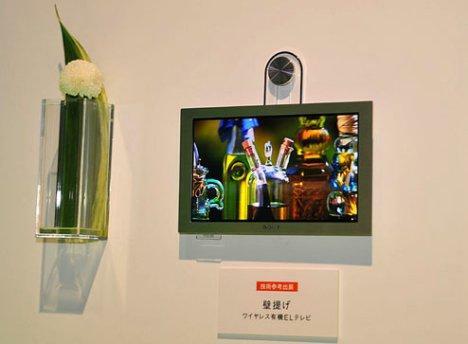 So in an effort to try and kick some life back into OLED televisions the boffins at Sony have made a completely wireless TV that has a built in HDTV tuner and, because let’s face it where else are you going to put it, they have included a wall mount. No need for power leads because all the power the little OLED TV needs comes from batteries. Sony has not mentioned the battery life and has no details on the wireless HD video and audio signal transmission but details will not be far away. There has also been no mention of the price but you can bet it will be more expensive than its wired brother, the XEL-1. Sony drops OLED in favour of FED TVs?